A few days later, she was formally diagnosed with Acute Lymphoblastic Leukemia. Two weeks after that, it was concluded that Karmyn had Philadelphia Positive ALL, which is very rare in pediatric Leukemia in that less than 5% of kids have it. Since then, Karmyn has turned 7 and her days have been mainly filled with trips to clinic at CancerCare, and admissions at Children's Hospital on CK5. Due to her high-risk Ph+ diagnosis, she has needed 5 cycles of intense chemotherapy over just the past 6 months. Karmyn is set to continue her treatment for approximately 2 more years. She has cried many tears, and she has seen the inside of many hospital rooms, and she has been bombarded with tubes and needles and machines that beep. She's seen the names of medications that most kids her age couldn't even read, but she's able to list them all out to you when asked. 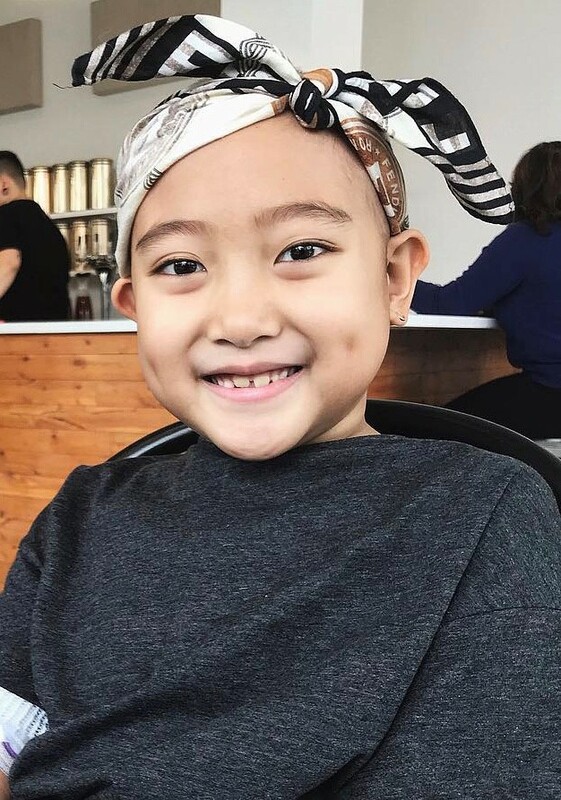 There have been tears and worries, doubts and fears - yet through it all, Karmyn has shown how strong and brave a kid can be in the face of something as immense as cancer. She's a girl who loves to smile, make funny faces at the camera, and crack jokes with her family. Although it took quite a while for her to warm up to the staff at the hospital, they are now finally seeing Karmyn for the sassy, fun-loving girl she truly is! She is the centre of our world, and we are so thankful for a star as bright as her.. There are a few things that Karmyn truly loves: her parents and older brothers Jordan and Keanan, FaceTiming with her cousins, doing arts and crafts and puzzles, playing board games and card games, being a leader in the classroom at school, any and all things Harry Potter, and watching foodie tour videos on Youtube. She's also a girl who knows her hearts and knows what she likes, and that's no exception when it comes to her favourite foods: there's creamy mac and cheese, toasted Nutella sandwiches, steamed pork dumplings, ramen (fancy or instant, it doesn't matter!) And above all - salmon sashimi. No matter the day, no matter the meal, no matter how nauseous she feels from chemo - she'll ask for salmon sashimi! So it was an absolute no-brainer choosing a trip to Tokyo, Japan as her Dream Experience! But the one thing you should know about her is: Karmyn has a sparkle when she smiles that can turn a gloomy day into sunshine, and she has shown how much of a force of nature she really can be. Ever since she was a baby, that smile has made us friends from all corners of the world on Instagram - from Vancouver to Germany to Singapore to the Dominican Republic. There are people near and far who have helped morally support us through this difficult adventure we call life, and we couldn't be more grateful for the genuine love and kindness complete strangers, and especially our extended family and friends, have shown our family throughout this trying time. And as we continue on this winding and uncertain path, we remain ever-hopeful that Karmyn will never lose her sparkle, that not even this beast called Cancer can dull her shine.